Starting Afresh. Three Ways I Welcome In The New Season. start to grow again and flowers appear. When January draws to a close everything starts to feel different. Spring is technically almost two months away but still everything feels like it shifts into the new season. The final remnants of Christmas are treated to the shame of the 70% off sticker and the new season collections lie in wait for January pay cheques to clear; it’s coming. I’ve always loved Winter, but I’m also always happy to see it start to give way to something new. Come February the Winter fatigue is very much in full swing. I start to change things over. The blankets that are folded neatly over the arms of the sofa are stowed away in the hope they won’t be required again until the autumn, the heating takes a step down and the curtains are taken down and washed ready for the sun to sail through them when it finally manages to scrape past the rooftops of the houses in front of mine. I might not be able to arrive home to my flat bathed in light just yet but I might as well be ready for it. The start of the new month seems like the perfect time to talk about the simple little things I change to trick myself into thinking those bright Spring days are a little closer than they actually are. 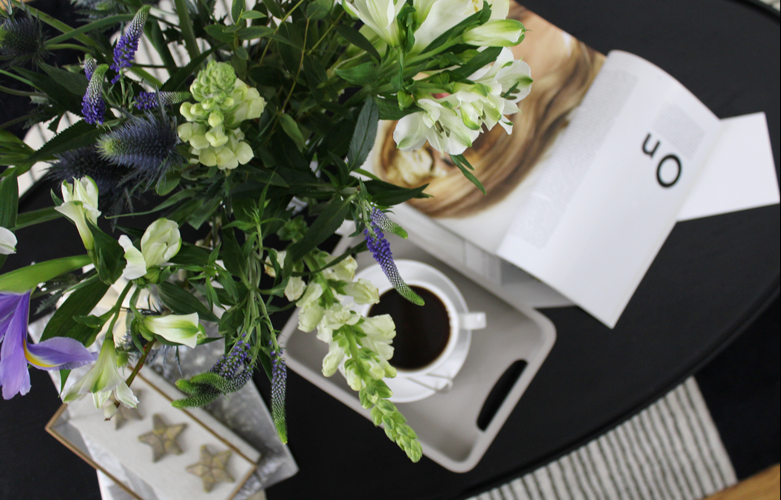 Flowers can change everything instantly – they’re the easiest way to make it feel like spring’s arrived. In winter my mantlepiece tends to be filled with gigantic bunches of eucalyptus or simple white roses. Once February arrives you’re more likely to find jars of hyacinths chopped from their bulbs before they fall to their floppy end mounting up on the surfaces, along with ramshackle collections of vases and jars filled to the brim with blooms. 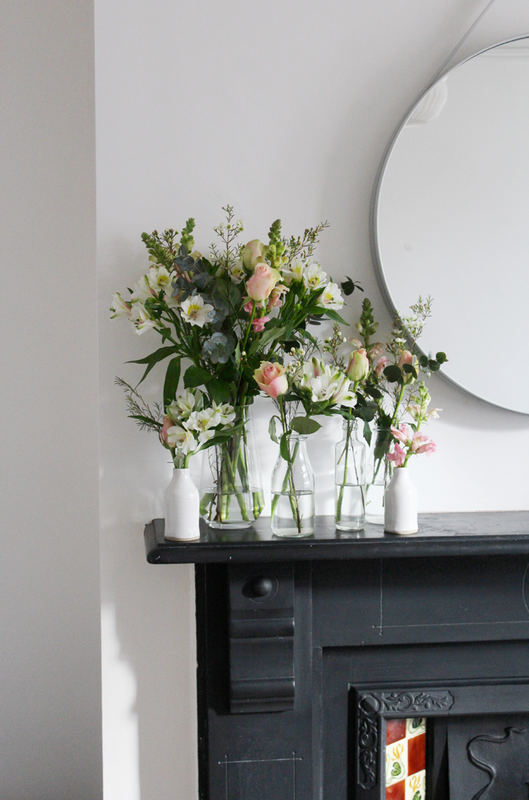 As I type this my mantlepiece is currently playing host to an orchestra of vases I’ve collected over the years, each filled with the soft pink and green hues of The Piper bouquet from Bloom & Wild. 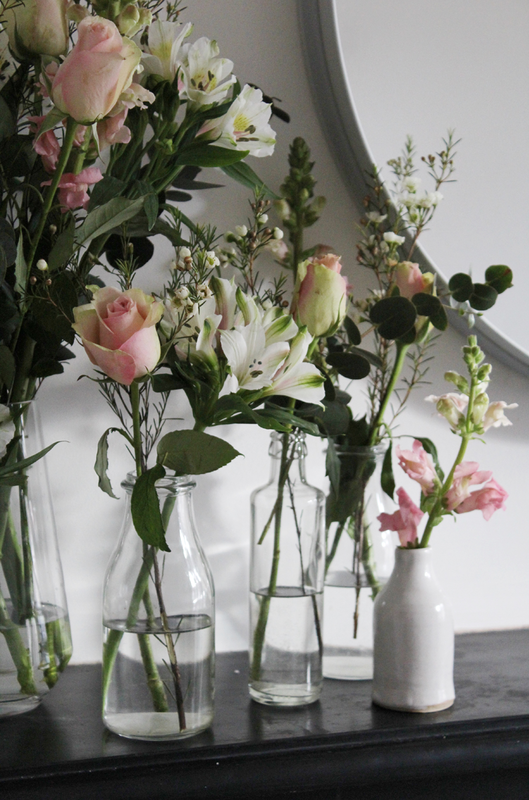 I’ve chosen to group the vases together, but realistically one letterbox bouquet is enough to fill a vase for each room in the flat. 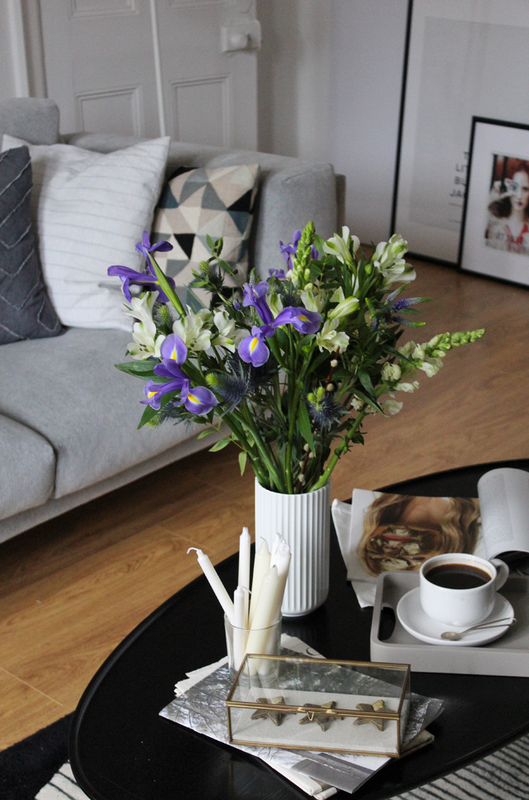 I think we get ourselves into the habits of thinking everything needs to be arranged in a single vase sitting in the centre of the coffee table. I’d rather flowers were everywhere, even if it’s just one or two in a tiny bud vase sitting on the side table. 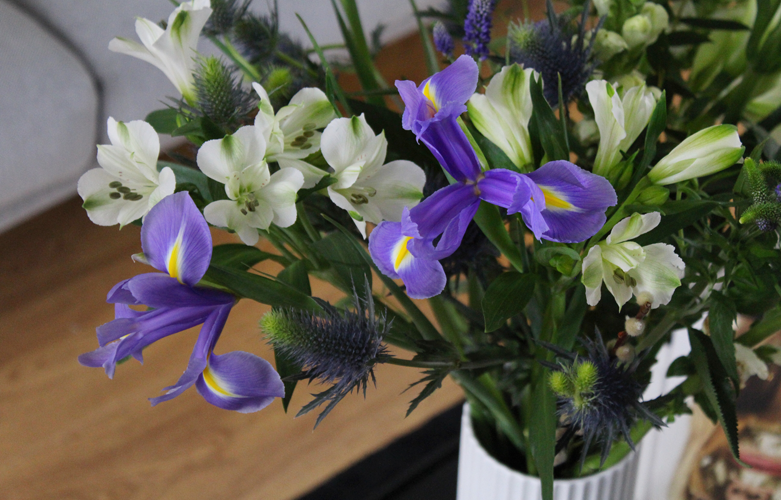 Never underestimate the power of flowers in a room. Also never underestimate the glory of beautiful bouquets than can be posted through your letterbox. 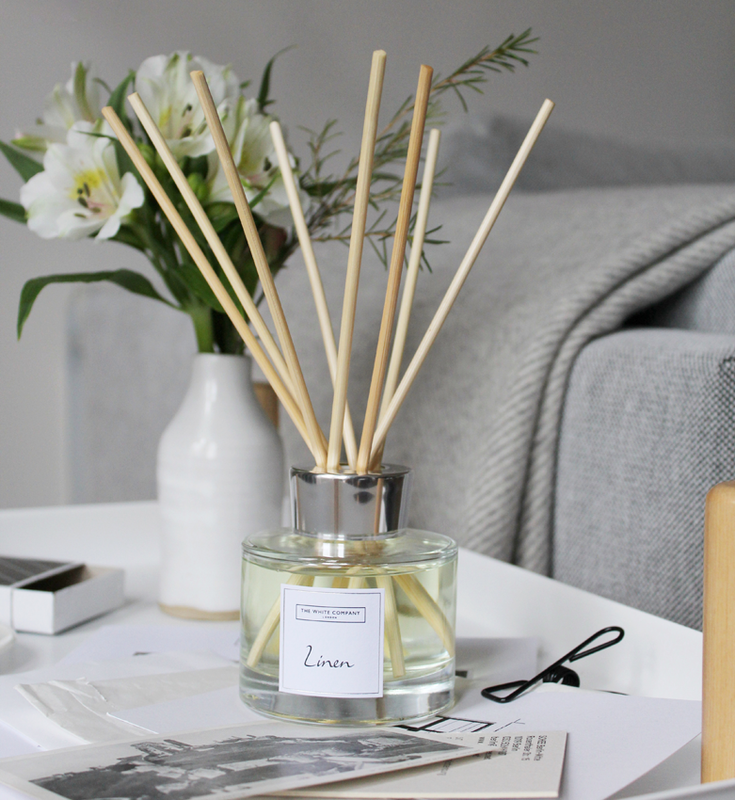 If you walk into my flat during the winter months you’ll likely be met by darker, musky scents that make you feel like there’s a log fire burning and maybe some mulled wine on the go. You’d smell that because there’s a plethora of candles and diffusers about the place designed to evoke those exact scents. After Christmas has been and gone I want everything to start to smell crisp and fresh, so the somewhat ceremonial switching over of the scents takes place. 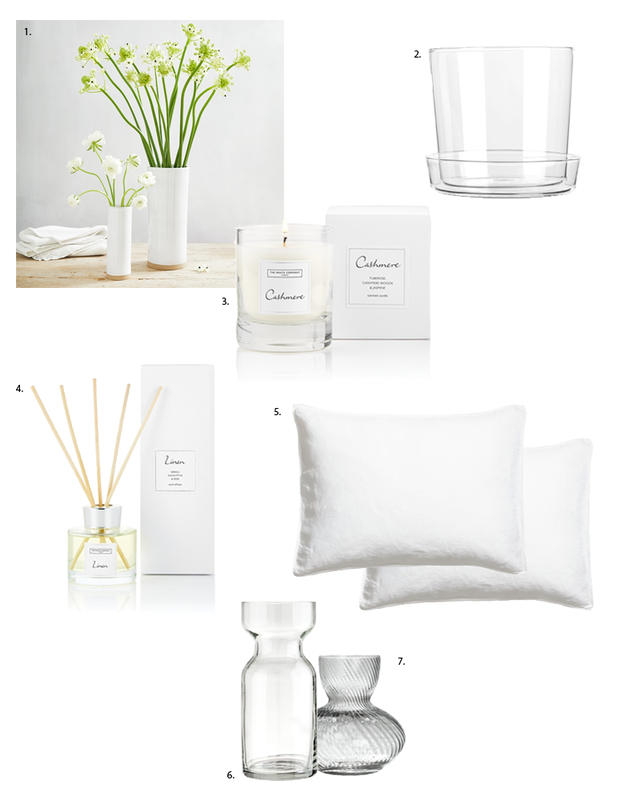 This month I swapped over the deep mossy diffuser I had in the dining room with The White Company’s latest fragrance, Linen. 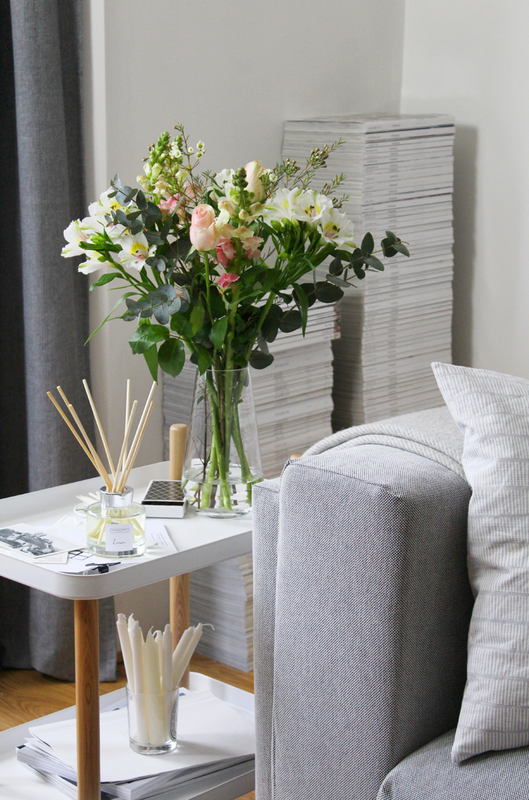 Now when you walk into the flat your nose will be met by the soft scent of neroli and eucalyptus. When you walk past it and that breezy scent of the Mediterranean catches you, it’s absolutely perfect. Like a sunny afternoon spent lazing about in the sun. For spring, The White Company have also looked to embody the luxury and comforting nature of everyone’s favourite thing, Cashmere. 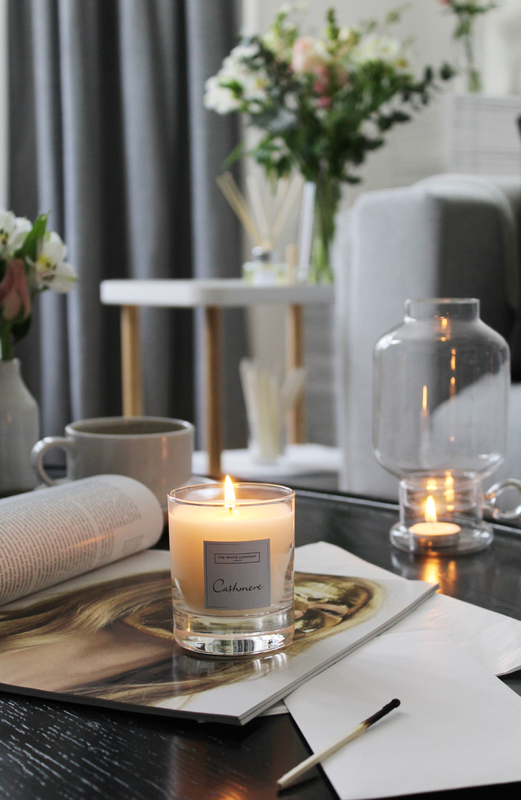 It’s warm and cosy without any of the heavier notes that fill winter’s fragrances, making it exactly right for February. 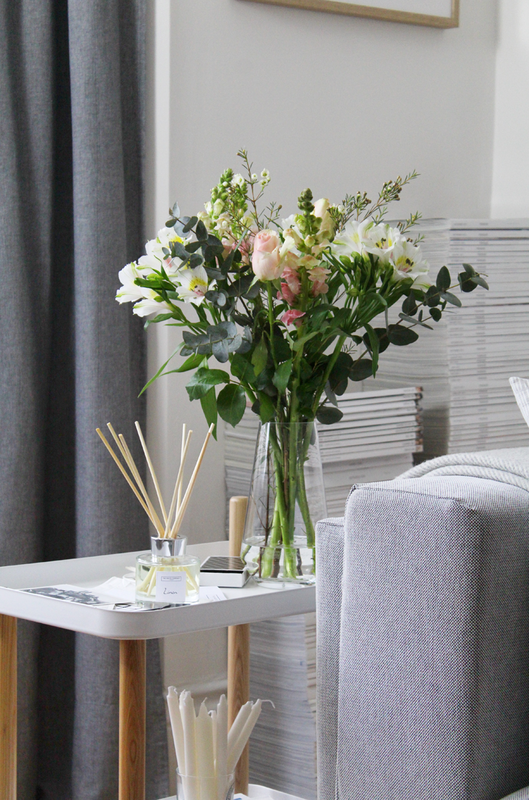 I genuinely believe the scent of a room is just as important as its colour or furniture. For me when I think back to places I’ve been I always remember how it smelt. So if someone leaves my home thinking it smelt like cashmere? I’m okay with that. Generally January is a month of tightening your belt and praying for your bank account to once again enter the world of positive numbers. In February I say you treat yourself to some small luxuries. It doesn’t have to be an extravagant purchase by any means, but after the mammoth task that was January, you deserve something just for you. 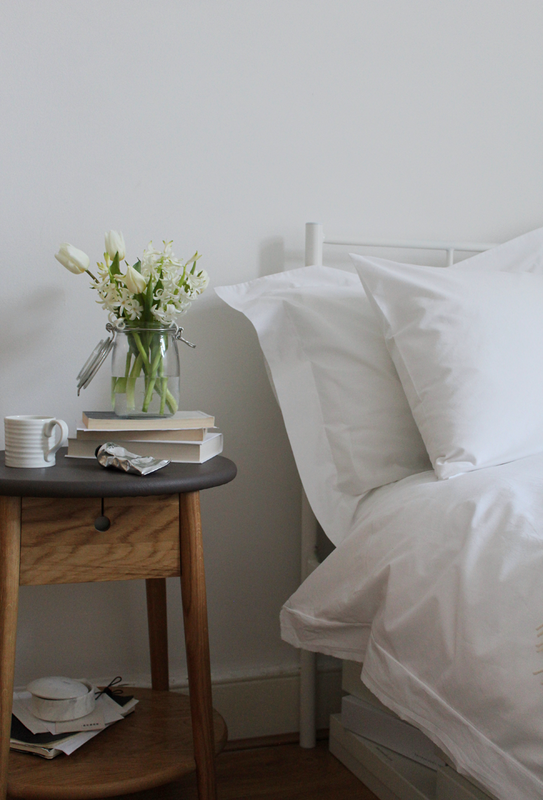 If a candle or a huge bunch of spring blooms isn’t for you, try treating yourself to fresh bedding. Maybe it’s because I’m getting old, or maybe it’s just because of the sheer volume of cool I possess, but very little ever makes me as happy as fresh bedding. There is nothing like waking up on a Sunday morning nestled beneath fresh sheets whilst the sun rises behind your curtains. February is when I treat myself to fresh bedding, although due to budgetary constraints I’ve kept it to just fresh pillowcases this year. White, naturally. 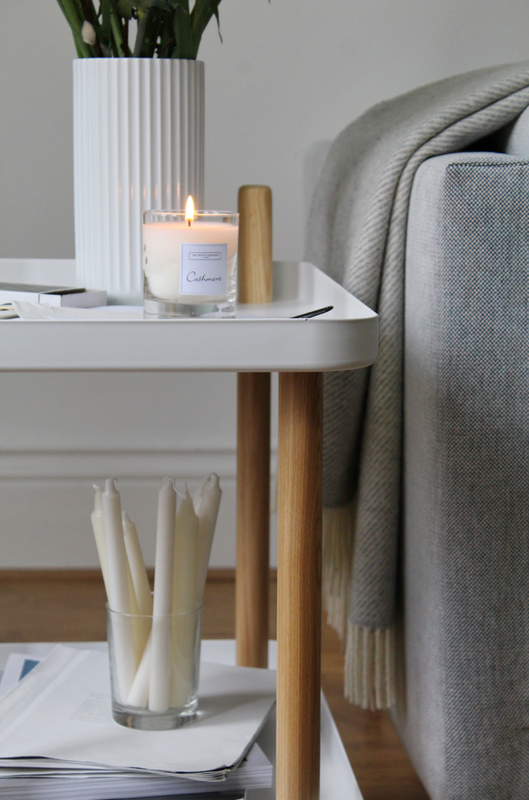 Team the crisp new sheets with a bedside table stacked with scented hyacinths and a freshly lit candle. It’s all your February could need.